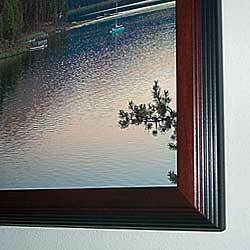 Not only does a canvas have unique texture, strong color yet high detail...the framed image is lightweight and easy to hang or move to a new location as needed. Our framed canvas images ship well (and therefore far) and cost less to ship than a matted picture framed under glass; AND they can be wood framed or gallery wrapped! Each finished canvas has been sprayed with durable uv protection multiple times to make them water & fingerprint resistant. Acrylic artist paints are hand brushed on many images to create a dimensional look with unsurpassed and long lasting color vibrance. Where the style of the finished product dictates, some photorealistic images have no hand brushed paint. The durability of varnish is the last step on all canvas prints. Our canvas images come in "Gallery Wrap" (where the image extends around the frame) or are bounded by a "Decorative Wood Frame" . 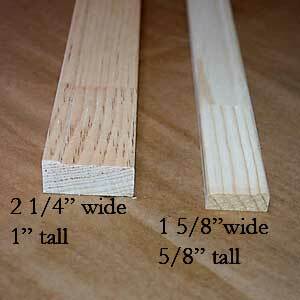 The thickness of the stretching frame is a function of the print size. Large prints (and most gallery wraps of any size) will have a deep stretching frame and small to medium prints have a less deep stretching frame. 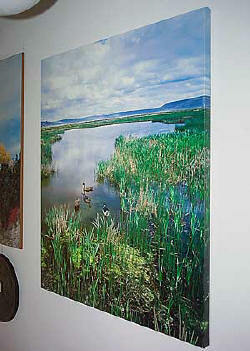 Here is a Canvas Print with a "Decorative Wood Frame"
Here are the deep and less deep stretching frames. Adding a wooden frame costs a little more but makes a stunning presentation! The "gallery wrap" on the left has the l" tall stretching frame (usual for gallery wrap)... the "decorative Wood Frame" has the 5/8" tall stretchframe.